Nestivity has officially launched its Twitter-based community management service, emerging from private beta to open to the public. Built entirely on top of Twitter, Nestivity functions as a Software as a Service tool that creates a community webpage based around a specific Twitter handle to create discussions and receive feedback. The idea is that brands will create “nests” from which customers and fans can interact with the company. Messages are sent out on Twitter and then automatically appear on nest pages, so it isn’t a whole new system that users have to sign up for. In a way, Nestivity counters one of Twitter’s weaknesses – it doesn’t really offer centralized pages for brands like Facebook and Google+ do. Companies can certainly customize their main Twitter pages, but those are more designed for reading tweets than they are for connecting with customers. “We built a community layer on top of Twitter to enable brands to form communities and host meaningful discussions directly on the platform they are already using,” Nestivity founder Henry Min said. Nestivity’s beta program lasted for three months and attracted 3,500 registrations, including Dell’s tech support center. The service is free to use, but premium plans add additional moderator accounts and longer archive options. Min said in an interview that he was inspired to build Nestivity after noticing that Twitter was morphing from conversations toward a broadcast platform. He highlighted a few brands, such as Whole Foods, Uber, Disney, Starbucks and Best Buy, that dialoguing with their customers, but noted that most brands use Twitter just to send out their own messages. Min claims that brands that use Nestivity will find that they can convert their follower base from a passive relationship to active brand participants. “By having a nest, you’re now saying you’ve rolled out the red carpet and you want to hear from them. You want them to tweet you,” he said. The startup has attracted the interest of several influencers. Min says that he showed an early version of Nestivity to Guy Kawasaki, and he really liked it. Nestivity will be an invaluable tool not only for individuals, but for brands who want to have a better customer service experience or host discussions about relevant topics via Twitter. The public-facing side of Nestivity looks simply like a discussion page with recent tweets, conversations. 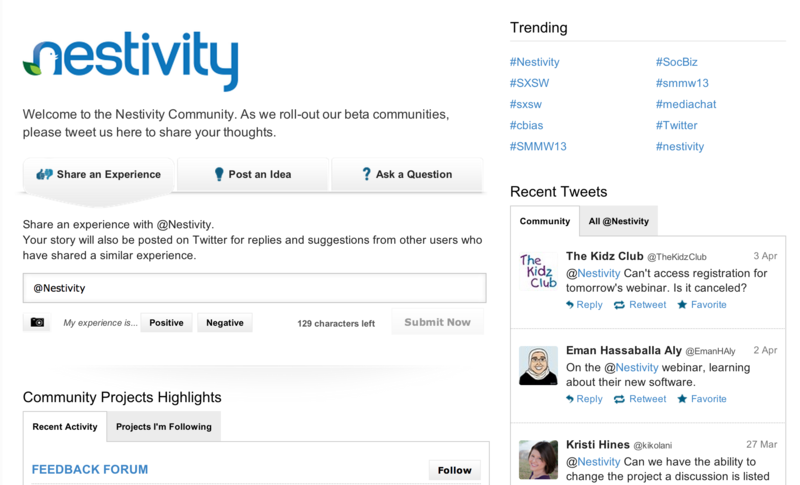 From the back-end, Nestivity looks more like a social media management tool, showing recent mentions and activity. Any tweet can be spun off into a discussion with its own individual link. Discussions can be customized with a title, photo, subject and suggested hashtags. Tracking Twitter conversations is painful. While the service does bundle replies into a thread, it’s often a mess as parallel conversations with different people often take place off the same tweet. 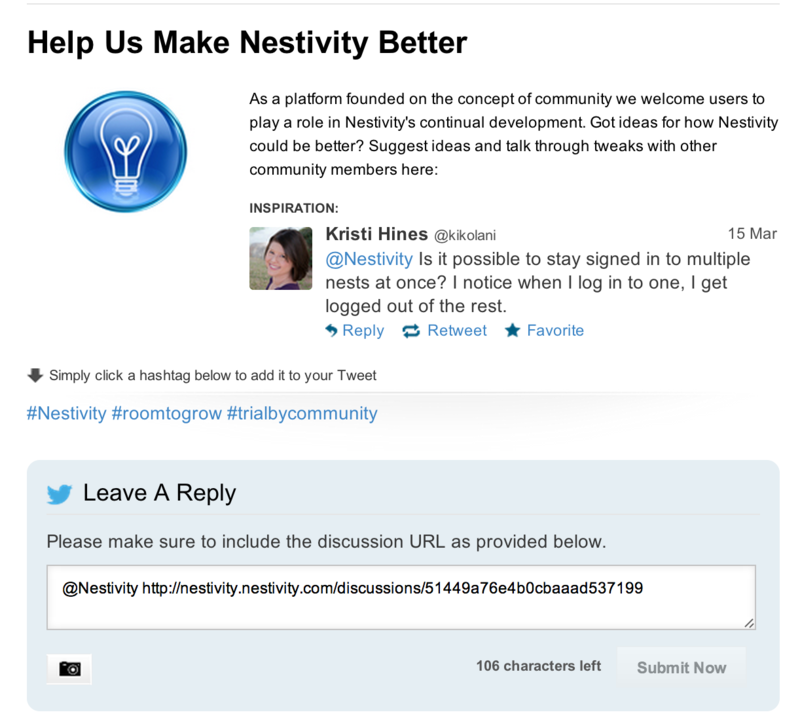 In many respects, the discussion feature of Nestivity feels a lot like Storify and Branch, but targeted at helping brands create a better sense of community. By default, nests will be hosted on Nestivity’s site, though vanity URLs are available to premium customers. Nestivity is supremely reliant on Twitter’s API, and I was curious whether Min was worried about placing the fate of his startup so much in Twitter’s hands. Min pointed out that Nestivity is built entirely in accordance with Twitter’s guidelines and best practices. “I feel like I’m following all the rules. That is something that I’m always going to have to keep an eye on,” he said. Now that Nestivity is open to the public, expect to see lots more nests cropping up around the Twitter-verse. I imagine companies will be eager to put the service to work at filling the community page-sized hole for their brands’ accounts.